In his State of the Union address, Obama stated his support for many programs, including increasing the minimum wage, funding free preschool education for all Americans and funding green energy projects. It is these policies that have come under fire by right wing politicos because they propose giving government money to groups which statistically vote Democratic. In the days after Obama’s February 2013 State of the Union address, many Republicans and right wing pundits have adopted the criticism that Obama promises “free gifts” to his constituencies in exchange for votes. This argument is both unfair and intentionally misleading to those who don’t understand how government works. In reality, all economic policy platforms have winners and losers, and the only real difference between different economic platforms is which group gets to be the winner. The criticisms of Obama’s policy proposals have been widely varied in wording, but probably the most succinct was delivered by Senator Rand Paul (R-KY) when he went as far as to refer to Obama’s State of the Union speech as presenting a “Santa Claus Platform” for Democratic constituencies. This attack draws the image of Obama as an unrealistic gift-giver, who hands out extravagant presents to those who he wants to reward for good behavior (his voters). When making these attacks, the right wing either fails to understand or willfully ignores that every policy choice is a matter of managing the needs of constituents—every policy platform is a “Santa Claus Platform” and the only real difference between platforms is who gets the good “gifts” and who gets the coal. At the very same time that the Republicans criticize Obama for giving gift to the people who voted for him, they propose policies that would give huge “gifts” to demographics of their choosing. The Republicans tend to support regressive economic policies that give massive benefits to the wealthy that are paid for by cutting services to the poor—in holding with Rep. Paul’s analogy, I would say that the Republicans are giving their gifts to the rich while leaving nothing but coal for the poor. Tax cuts, decreased worker protections, and crippled environmental regulations are all “gifts” to the rich and should be seen as such. As both parties give “gifts” to their constituents, this discussion boils down to a very simple choice for voters: Which party’s “gifts” are more valuable to society and thus are more worthy of being sustained? An increase in the minimum wage is massively beneficial to the poor and will have wide-ranging affects in society. Increasing the money available to the poor (minimum wage workers) allows them to better provide for their families and increases their chances of bettering their circumstances. In addition to the personal benefits to these individuals, the increased buying power that comes with their new funds boosts the economy and mitigates the potential negative effects of the increased wages on businesses (they may be paying their workers more, but the new business that comes from the increase overshadows this loss). 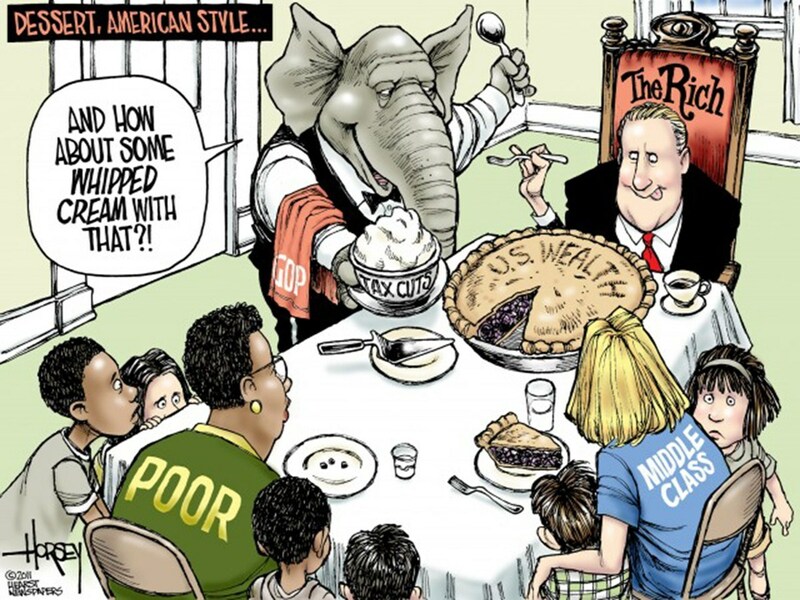 Republicans propose giving the “gifts” of tax breaks to the rich and welfare to large corporations. Unfortunately, these proposals have little benefit to society as a whole and, if the past decade of conservative gifting is any indication, they only serve to enrich those already at the top. Tax breaks for the rich do not stimulate demand in the way that augmenting the buying power of the poor and middle classes does; because of this, such tax breaks are purely gifts for the wealthy, paid for by the middle class, that have no real benefit for society. Corporate welfare is not always bad (ex. investing in a vulnerable or vital market), but the programs supported by the current Republicans are most-often wasteful gift to the wealthy. Oil companies and defense contractors (two favored industries) are immensely profitable and any attempts to subsidize their profits are simply attempts to pad the profit margins of the already wealthy. When the Republicans talk about Obama’s gifting program, you shoul always consider the alternative. Would you rather support the Democratic “gifting” programs intended to help the needy, or would you rather support the Republican “gifting” program intended to help the already wealthy? Which “gifting” program is more beneficial to your and your country’s well-being?